The findings, published recently in the journal Cell Reports, show that invasive tumors can begin sending out tumor cells far earlier than previously thought. These escaping cells—which can enter the bloodstream before the primary tumor is detected—may seed secondary tumors that don't show up for years. Importantly, the scientists demonstrated that the escaping tumor cells reach the bloodstream by entering blood vessels deep within the dense tumor core, upending the long-held belief that metastatic cells come from a tumor's invasive borders. "The actual process of cancer cell dissemination via hematogenous routes is a relatively under-studied process, but we finally have an answer as to where it takes place," said TSRI Assistant Professor Elena Deryugina, who led the study in a long-term collaboration with TSRI Staff Scientist William Kiosses. This finding may also shed light on why patients with early stage tumors still have a risk of developing metastatic disease. "These metastases may have been seeded when the primary tumor was even too small to be visualized," Deryugina said. The new study is also the first to examine entire tumors to find out exactly where escaping cells come from. The scientists tagged human tumor cells with a florescent protein to distinguish them from the cells of a tumor-bearing animal. Using high-resolution confocal microscopy techniques spearheaded by Kiosses, the researchers mapped in 3-D all blood vessels across entire tumors, from the tumors' dense cores to their invasive tendrils. The researchers also found that levels of a protein called EGFR could be a good indicator of whether tumor cells would intravasate. 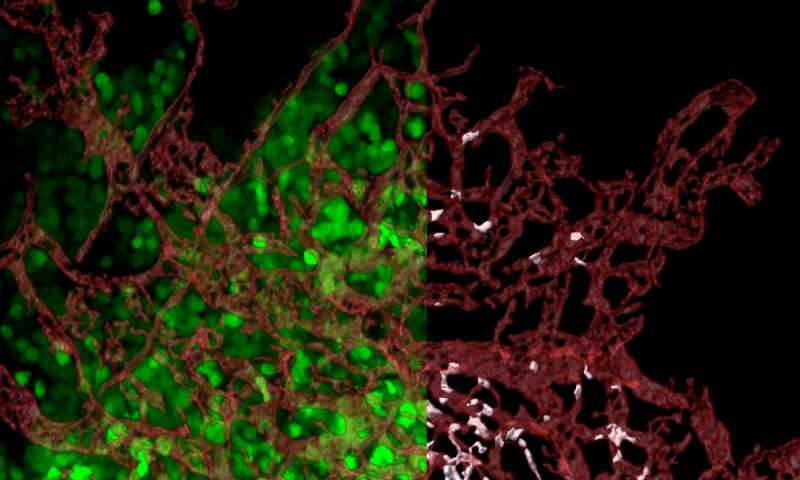 EGFR appeared to regulate a tumor's ability to induce blood vessels that support cancer cell escape. "Therefore, the data indicate the importance of harnessing the EGFR activity early on in cancer patients," said Deryugina. The study, "Intratumoral Cancer Cell Intravasation Can Occur Independent of Invasion into the Adjacent Stroma," was supported by the National Institutes of Health (grants R01CA105412, R01CA129484 and R01CA157792).